Objective: We compared the pre- and post-operative right ventricular (RV) function by tricuspid annular plane systolic excursion (TAPSE) between trans-right atrial (t-RA) versus t-RA/RV (RA/RV) approach for the repair of Tetralogy of Fallot (TOF). Patients and Methods: Fifty consecutive patients, 1–15 years of age, undergoing intracardiac repair of TOF between September 2015 and June 2016 were randomized into two groups based on the approach for repair as follows: t-RA or t-RA/RV approach. TAPSE was used for the assessment of pre- and post-operative RV function. Results: Age, body surface area, preoperative saturation, cardiopulmonary bypass and aortic cross-clamp times, inotropic score, postoperative intensive care unit, and hospital stay were similar in both the groups. However, t-RA/RV group had significant mediastinal drainage (169 ± 163 ml vs. 90.6 ± 58.7 ml, P < 0.05) and pleural effusions (8 vs. 2 patients, P < 0.05), but had better relief of RV outflow tract gradients. The mean follow-up was 23 ± 6.7 (median 26, range 21–29) months. There were no differences in arrhythmias in either group up to the 1st month and at last follow-up. 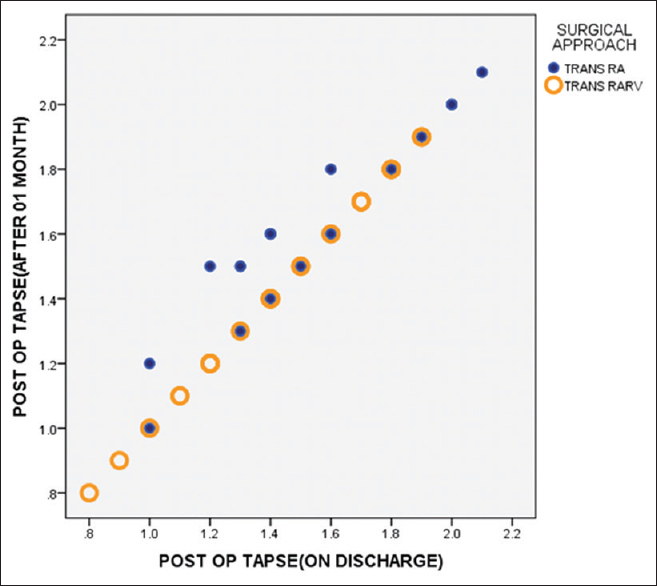 Preoperative TAPSE for t-RA and t-RA/RV was similar (1.49 ± 0.29 vs. 1.66 ± 0.34, P > 0.05) and so was the post-operative TAPSE at discharge (1.52 ± 0.30 vs. 1.43 ± 0.32, P > 0.05), at 1 month (1.6 ± 0.27 vs. 1.43 ± 0.032, P > 0.05) and at last follow-up (1.79 ± 0.15, median 1.8 vs. 1.72 ± 0.17, median 1.7 P > 0.05). Conclusion: Both t-RA and t-RA/RV approaches provide safe palliation for patients with TOF. A limited right ventriculotomy neither leads to deleterious effects on early RV function nor does it increase the incidence of arrhythmias at early follow-up. Larger studies with longer follow-up are needed to further address these issues. There were 25 patients in each arm designated as Group 1 (operated through t-RA route) and Group 2 (Operated through combined t-RA/RV approach). Patient demographics are shown in [Table 1]. There were no differences between the two groups with respect to demographics, preoperative RVOT gradient, and RV function. The patients in each group were subjected to surgery by a single surgeon (ST) operating in a reproducible manner, and any given patient was deemed suitable for intracardiac repair by either approach without a transannular patch on preoperative evaluation and after opening the pericardium. The pulmonary artery annulus of each patient was sized peroperatively as described above and a Z-value of the pulmonary annulus up to −3 was accepted to avoid a transannular patch. Intra- and post-operative results are detailed in [Table 2]. The two groups had comparable CPB and aortic cross-clamp times. There were no early deaths in either group. There were no significant differences between the two groups with respect to the duration of mechanical ventilation, inotropic score, ICU, and hospital stay. However, a significant number of patients in Group 2 had pleural effusion, and the quantity of mediastinal drain in the same group was significantly higher leading to increased number of reexplorations. Three patients from group two were reexplored for bleeding, and the bleeding site was found to be from the patch in one and from retrosternal tissue in the other two. The mean pre-TAPSE for Group 1 was 1.49 ± 0.29 cm and that for Group 2 was 1.66 ± 0.34 cm, and the difference between the two groups was not significant [Table 3]. Age-wise normal TAPSE values for both the groups were evaluated and compared between the two groups, which revealed well-matched groups without any statistically significant differences. After TOF repair, there was a reduction in the mean TAPSE for both groups; however, the differences between the groups were not significant. At 1 month of follow-up, echocardiography revealed marginal improvement of TAPSE values in Group 1, while in Group 2, the TAPSE values remained static. However, this was not statistically significant. 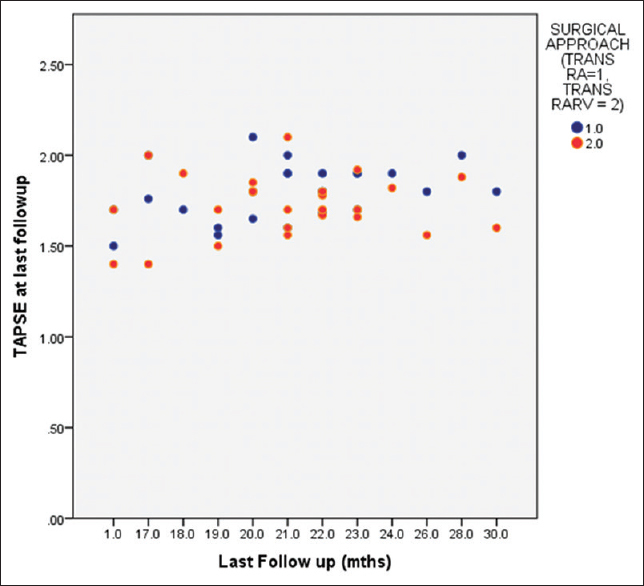 The linear correlation between the TAPSE values in immediate postoperative period and 1 month later in both groups is depicted in [Figure 1]. At a mean follow-up of 23 ± 6.7 (median 26, range 21–29) months, TAPSE values improved to 1.79 ± 0.15 (median 1.8) versus 1.72 ± 0.17 (median 1.7) in Groups 1 and 2, respectively, P > 0.05 [Figure 2]. Lillehei CW, Cohen M, Warden HE, Read RC, Aust JB, Dewall RA, et al. Direct vision intracardiac surgical correction of the tetralogy of fallot, pentalogy of fallot, and pulmonary atresia defects; Report of first ten cases. Ann Surg 1955;142:418-42. Kirklin JW, Ellis FH Jr. Mcgoon DC, Dushane JW, Swan HJ. Surgical treatment for the tetralogy of fallot by open intracardiac repair. J Thorac Surg 1959;37:22-51. Hudspeth AS, Cordell AR, Meredith JH, Johnston FR. An improved transatrial approach to the closure of ventricular septal defects. J Thorac Cardiovasc Surg 1962;43:157-65. Sakornpant P, Athapaisalsarudee S, Kojaranjit V. Isolated transpulmonary repair of tetralogy of fallot. J Card Surg 1995;10:10-3. Alexiou C, Chen Q, Galogavrou M, Gnanapragasam J, Salmon AP, Keeton BR, et al. Repair of tetralogy of fallot in infancy with a transventricular or a transatrial approach. Eur J Cardiothorac Surg 2002;22:174-83. Singh RS, Kalra R, Kumar RM, Rawal N, Singh H, Das R. Assessment of right ventricular function in post-operative patients of tetralogy of fallots and its predictive factors. World J Cardiovasc Surg 2014;4:139-50. Meluzín J, Spinarová L, Bakala J, Toman J, Krejcí J, Hude P, et al. Pulsed doppler tissue imaging of the velocity of tricuspid annular systolic motion; A new, rapid, and non-invasive method of evaluating right ventricular systolic function. Eur Heart J 2001;22:340-8. Kaul S, Tei C, Hopkins JM, Shah PM. Assessment of right ventricular function using two-dimensional echocardiography. Am Heart J 1984;107:526-31. Gaies MG, Gurney JG, Yen AH, Napoli ML, Gajarski RJ, Ohye RG, et al. Vasoactive-inotropic score as a predictor of morbidity and mortality in infants after cardiopulmonary bypass. Pediatr Crit Care Med 2010;11:234-8. Jurcut R, Giusca S, La Gerche A, Vasile S, Ginghina C, Voigt JU, et al. The echocardiographic assessment of the right ventricle: What to do in 2010? Eur J Echocardiogr 2010;11:81-96. Patel K, Talwar S, Gupta SK, Choudhary SK, Kothari SS, Airan B. Transatrial repair of tetralogy of fallot: Midterm results. Indian J Thorac Cardiovasc Surg 2015;31:1-7. Bigdelian H, Sedighi M. Repair of tetralogy of fallot in infancy via the atrioventricular approach. Korean J Thorac Cardiovasc Surg 2016;49:9-14. Lee JR, Kim JS, Lim HG, Hwang HY, Kim YJ, Rho JR, et al. Complete repair of tetralogy of Fallot in infancy. Interact Cardiovasc Thorac Surg 2004;3:470-4. Hudspeth AS, Cordell AR, Johnston FR. Transatrial approach to total correction of tetralogy of fallot. Circulation 1963;27:796-800. Edmunds LH Jr. Saxena NC, Friedman S, Rashkind WJ, Dodd PF. Transatrial repair of tetralogy of fallot. Surgery 1976;80:681-8. Airan B, Choudhary SK, Kumar HV, Talwar S, Dhareshwar J, Juneja R, et al. Total transatrial correction of tetralogy of fallot: No outflow patch technique. Ann Thorac Surg 2006;82:1316-21. Dietl CA, Cazzaniga ME, Dubner SJ, Pérez-Baliño NA, Torres AR, Favaloro RG, et al. Life-threatening arrhythmias and RV dysfunction after surgical repair of tetralogy of fallot. 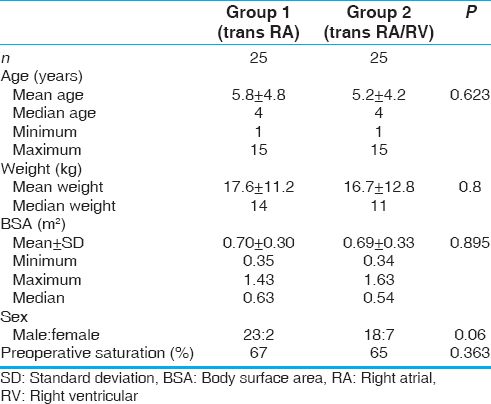 Comparison between transventricular and transatrial approaches. Circulation 1994;90:II7-12. Miura T, Nakano S, Shimazaki Y, Kobayashi J, Hirose H, Sano T, et al. Evaluation of right ventricular function by regional wall motion analysis in patients after correction of tetralogy of fallot. Comparison of transventricular and nontransventricular repairs. J Thorac Cardiovasc Surg 1992;104:917-23. Gnanappa GK, Rashid I, Celermajer D, Ayer J, Puranik R. Reproducibility of cardiac magnetic resonance imaging (CMRI)-derived right ventricular parameters in repaired tetralogy of fallot (ToF). Heart Lung Circ 2018;27:381-5. Carminati M, Pluchinotta FR, Piazza L, Micheletti A, Negura D, Chessa M, et al. Echocardiographic assessment after surgical repair of tetralogy of fallot. Front Pediatr 2015;3:3. Lang RM, Badano LP, Mor-Avi V, Afilalo J, Armstrong A, Ernande L, et al. Recommendations for cardiac chamber quantification by echocardiography in adults: an update from the American Society of Echocardiography and the European Association of Cardiovascular Imaging, Eur Heart J Cardiovasc Imaging 2015;16:233-71. Mercer-Rosa L, Parnell A, Forfia PR, Yang W, Goldmuntz E, Kawut SM, et al. Tricuspid annular plane systolic excursion in the assessment of right ventricular function in children and adolescents after repair of tetralogy of fallot. J Am Soc Echocardiogr 2013;26:1322-9. Koestenberger M, Nagel B, Avian A, Ravekes W, Sorantin E, Cvirn G, et al. Systolic right ventricular function in children and young adults with pulmonary artery hypertension secondary to congenital heart disease and tetralogy of fallot: Tricuspid annular plane systolic excursion (TAPSE) and magnetic resonance imaging data. Congenit Heart Dis 2012;7:250-8. Aloia E, Cameli M, D'Ascenzi F, Sciaccaluga C, Mondillo S. TAPSE: An old but useful tool in different diseases. Int J Cardiol 2016;225:177-83. Bacha EA, Kalimi R, Starr JP, Quinones J, Koenig P. Autologous repair of supravalvar pulmonic stenosis. Ann Thorac Surg 2004;77:734-6.